Should I have my Windscreen Chip Repaired? 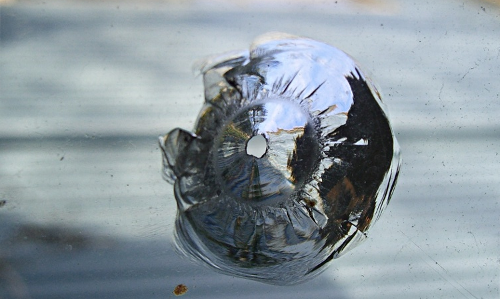 In almost all cases a Windscreen chip or crack can be repaired and should be repaired as quickly as possible. After a chip or crack appears, you should protect the damaged area with a "screensaver" or tape. Invariably there is always a small hole from the initial impact that is susceptible to contamination from dirt or moisture. Remember, a chip that has been kept clean, will result in an enhanced appearance and clarity after your repair. Covering the damaged area will not stop the chip from spreading so contact Inspecta Crack® for assessment ASAP! Do not be tempted to apply "home remedies" such as rain repellants, soap, baby oil, finger nail polish, glue or other chemicals as these will only make a repair more difficult and possibly more expensive. Will a Windscreen Chip ever form a Crack? The possibility of a chip developing into a crack is greater if it is not repaired. Once a chip has been repaired it will not form a crack under normal circumstances. If a windscreen chip is not repaired it can develop into a crack if there is sudden change in temperature such as might occure if you wash the windscreen with cold water on a hot day, or if other stresses are applied such as hitting a large pothole whilst driving. It saves you money. Repairs are much cheaper than replacing a windscreen. It is more convenient and takes less time. It means that you retain the integrity of the factory seal around the windscreen that would have to be replaced with a windscreen replacement. You keep the original, often higher quality factory fitted glass. In most cases a timely repair can remove the necessity of a costly windscreen replacement and a repaired windscreen returns to its former strength and appearance. What type of chips and cracks can be repaired? Windscreen chips up to the size of a 50 cent piece and cracks up to 150mm can be repaired. The best quality repair is achieved if it is carried out before any contamination from eviromental elements (dust etc) or washing. There are different types of chips and some can show a silver or black colour but this will usually disappear which the bonding agent is applied so they can still be repaired. Can a Chip spread while it is being repaired? This is only likely to occur if a repair is carried out on a car that has been sitting for some time in the direct sun on a hot day. Under these circumstances a windscreen on a car with the windows wound up can be over 50 degrees. Industry statistics indicate that the chances of a chip developing into a crack while being repaired is about 1 in 5000 and less with the precautions we take. Where do I get my windscreen repaired? We offer a mobile service so we can do a repair wherever you are, whether at home, at your office carpark, or even at your hotel or campsite if you are holidaying. Typically a star or bullseye chip can be repaired in about half an hour from beginning to end. If you have more than one chip add another 15 minutes per chip. Drive away times are 40 minutes for most cars. How will the windscreen look after a chip or crack is repaired? After a repair your windscreen will be noticably clearer. Optical clarity varies from 85% to 100% depending on the size, age and amount of glass missing from the centre and how much the glass has fragmented. Often our customers have difficulty seeing where the repair has been made.